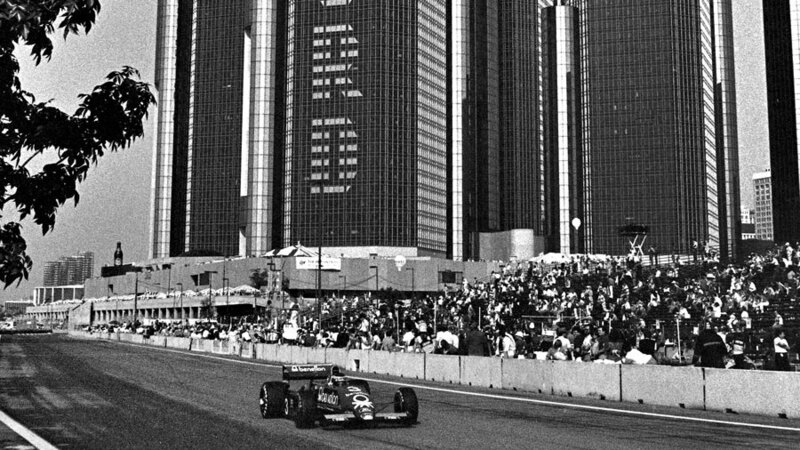 Michele Alboreto recorded his second grand prix win on the street circuit in Detroit on a weekend the turbocharged cars were found wanting with only four out of 12 finishing the race. It was fitting that in front of Ford's most important people, the Cosworth-powered Tyrrell won in the motor city. However, it was the last win for a normally-aspirated engine until turbos were outlawed in 1988. It was the 155th and final time the iconic Ford Cosworth DFV V8 powered an F1 race winner and also the last for the brilliant Ken Tyrrell's eponymous team. It could have been a different result had Nelson Piquet's race-leading Brabham not suffered a slow puncture with ten laps to run but Alboreto was ideally placed to pick up the pieces and close the non-turbo era. The first attempt to start was abandoned when Andrea de Cesaris stalled on the grid, causing one lap to be knocked off the race distance. At the second attempt Patrick Tambay stalled his Ferrari yards after the green light but the field got away nonetheless. An angry Tambay was towed away rather than being push-started as he had been promised at the drivers' briefing. The car was just out of the way when the leaders completed the first lap with Nelson Piquet's Brabham heading the pack from the surviving Ferrari of Rene Arnoux and Elio de Angelis' Lotus. Piquet had elected to run on a full tank of fuel and therefore go the distance without stopping whereas most of the field had a one-stop strategy. Therefore, his pace was slower than that of the chasing Arnoux who eventually passed and pulled away. Arnoux's Ferrari expired shortly after he had pitted. Piquet, meanwhile, just waited for the others to pit and continued to drive his own race. When the stops were done, he led from Alboreto who patiently and in vain waited for Piquet to pull in. But Piquet's plans came unstuck when his handling started troubling him and he had to pit with a slow puncture. He rejoined back in fourth and remained there, but with Alain Prost out of the points in eighth he moved within a point of the Frenchman in the drivers' championship. Keke Rosberg took second, holding off a determined late challenge from John Watson who broke the lap record in the closing stages.